We have provided instructional videos, in addition to written step by step instructions, as required and as applicable, for some of our products, for the purpose of guiding the user in the methodical assembly of such. Please study the instructional videos and assembly manuals before assembly. MIA Micro-FLIGHT via our Contact Us page. MIA Micro-FLIGHT is not liable for any mishap that may result from the handling, use or misuse of MIA products. Radio Controlled Hobby Products are not child toys and USER must be already familiar with the operation and regulations that are required to operate Electric/Electronic RC models safely and within the rules of your specific municipality. User is fully responsible and liable for the safe handling, assembly and operation of products purchased from MIA Micro-FLIGHT or from any of MIA's Approved Distributors. Some of our products may come with RC/Electric/Electronic propulsion and control systems which have been selected and properly matched with the specific product they power. Do Not make modifications to these. At times we have been asked to provide models specifically designed for Model Fuel Engines and this is supplied on a "Special Order" basis, due to the nature of heavier structures required and products need to be engineered to support such type engines. If this is within your requirements, please request so as a "Special Order" via our Contact Us page. If MIA Products call for an option for user to use their own RC equipment, please follow the MIA Suggested Guidelines and Specifications that come with such. Due to the nature of some of our products, we ask the user to exercise caution, in handling tools and materials required to assemble, finish and decorate such. If you are not familiar with such, please seek expert guidance, or Contact Us for assistance. Some of MIA products contain small parts made from Wood, Plastic, Metal and Composite materials, typically used for Radio Control Models, thus, these are not meant for children. These products and parts are meant for mature Radio Control Model enthusiasts, who already have some knowledge of assembling miniature, scale or RC models and are familiar working with similar materials and tools for assembling such. MIA Micro-FLIGHT prides itself in the design and manufacturing of each Product Kit and each one is factory tested and Kits are factory "boxed" (assembled) in a methodical and controlled way for completeness and quality assurance. 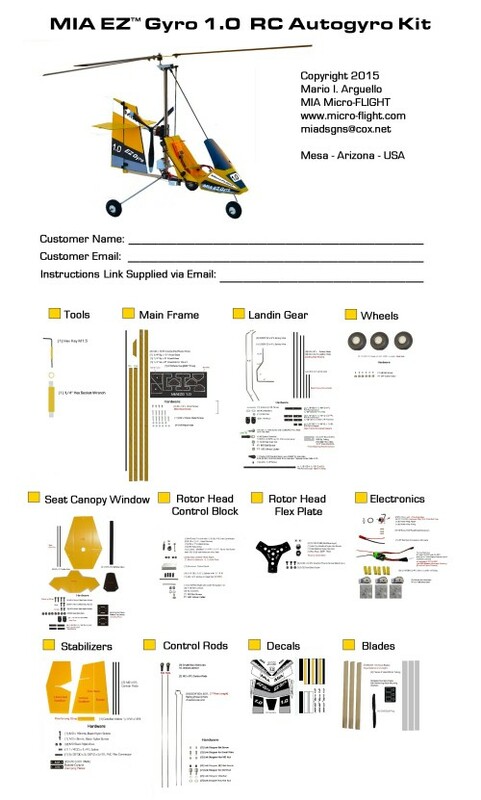 We have made countless Product Videos and have posted them on our You-Tube Channel, via our web site links, to illustrate the operation and flight characteristics of each model we manufacture, so that the end user has a good idea of what to expect before and after assembling it and provided it is assembled as per instructions supplied with each kit. On MIA products that are purchased as "Stock Kits", open package, user modified kits and or parts voids product warranty. USER agrees not to reverse engineer, duplicate or modify the original MIA Micro-FLIGHT design product or repackage for resale.